A goal of individual brilliance from Ricardo Fuller condemned West Ham to their sixth straight League defeat. Substitute Fuller had only been on the pitch for two minutes when he skipped past three Hammers defenders and fired his shot past goalkeeper Robert Green. And the result left West Ham level with 18th-placed Hull, who have played one match fewer than the London club. The hosts' best passage of play came in the first half, with Mido making a terrible mess of an inviting chance. With the game still goalless, and Stoke's early threat successfully nullified by a Hammers defence who had started nervously, Mido found himself unmarked when Carlton Cole's shot rebounded into his path following Thomas Sorensen's save. But the Egypt international, one of five changes made by under-pressure boss Gianfranco Zola following co-owner David Sullivan's brutal public assessment of his side's defeat by Wolves in midweek, failed to bring the rebound under control with the ball bouncing off his thigh and the chance passed. The quality shown by Fuller on the other hand - in what was otherwise a match of limited calibre - lit up the game. His goal must have provoked despair for Hammers fans whose team ended the day only outside the relegation zone by virtue of goal difference, following Hull's 2-0 win over Fulham. Fuller, who replaced Matthew Etherington on 67 minutes after Tony Pulis had already made two injury-enforced switches, received a long ball outside the area with his back to goal - and there appeared to be little threat for the West Ham defenders. However, with one skilful touch Fuller turned Manuel Da Costa, leaving the Portuguese defender on his back, and as Scott Parker and Matthew Upson arrived late on the scene with weak tackles the Jamaica striker calmly drilled the ball home. Kieron Dyer's pace down the right wing proved a menace to the Potters' defence, but with his fitness clearly still an issue, he failed to start the second half, giving way to Alessandro Diamanti. The initial threat from Stoke came from set pieces. They had four corners in the first half and might have scored from at least two of them. Abdoulaye Faye, who only lasted 25 minutes before limping off with a twisted knee, was at the far post to meet one corner, after Dave Kitson had flicked on the initial delivery from Liam Lawrence. His volley was cleared off the line by Mido, and when Etherington sent over the next one, Faye headed wide from a clear header. By then, Lawrence could have opened the scoring for Stoke but, in a rare blemish from what was otherwise a productive performance, he blazed a promising opportunity wide. Danny Higginbotham was also wasteful from another accurate Etherington corner. West Ham enjoyed some excellent chances of their own. Apart from Mido's miss, Cole also had an opportunity to score but was unable to get enough control of the loose ball to test Sorensen after being put free following an error from Robert Huth. The second half began quietly but Fuller's magical finish prompted a frantic finale. West Ham drilled long, speculative balls into the area. Generally Stoke coped well. In injury time, an equaliser might have arrived when Jonathan Spector's cross found the back of Cole's head, but the ball just sailed over the corner of Sorensen's goal. And as the rain came down, Stoke held on to take the points. "It was a fantastic goal. Ric can do that. As a player, if he gets in that position he is so strong and his feet are so quick he can do that. It was a special goal. 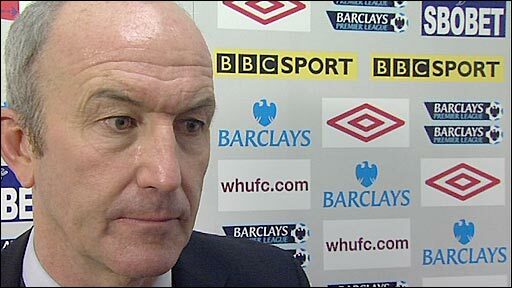 "If we can get to 40 points [Stoke are 10th with 39] that is definitely safe. We finished 12th last year with 45 points. "It would be lovely to get 46 points. To reach the quarter-finals of the FA Cup and to beat that tally would be a real good season for us." 90:00+4:35 The final whistle is blown by the referee. 90:00+3:49 Foul by Alessandro Diamanti on Ricardo Fuller, free kick awarded. Direct free kick taken by Thomas Sorensen. 90:00+2:34 Danny Collins concedes a free kick for a foul on Scott Parker. Alessandro Diamanti produces a shot on goal direct from the free kick. 90:00+1:56 The ball is delivered by Scott Parker, Effort from deep inside the area by Araujo Ilan misses to the right of the target. 90:00+1:15 Direct free kick taken by Manuel Da Costa. 90:00+1:15 Booking Rory Delap receives a yellow card. 90:00+1:09 Rory Delap challenges Scott Parker unfairly and gives away a free kick. 90:00+0:39 Free kick awarded for a foul by Valon Behrami on Tuncay Sanli. Free kick taken by Danny Collins. 89:58 The ball is crossed by Jonathan Spector, Headed effort on goal by Carlton Cole from inside the penalty box misses to the right of the goal. 88:48 Alessandro Diamanti takes the outswinging corner, Rory Delap manages to make a clearance. Thomas Sorensen fouled by Manuel Da Costa, the ref awards a free kick. Thomas Sorensen restarts play with the free kick. 88:35 Centre by Carlton Cole, clearance made by Rory Delap. 87:07 Tuncay Sanli challenges Scott Parker unfairly and gives away a free kick. Direct free kick taken by Robert Green. 86:33 Liam Lawrence decides to take the corner short. 86:00 Araujo Ilan is penalised for handball and concedes a free kick. Thomas Sorensen takes the free kick. 85:51 Jonathan Spector delivers the ball, clearance by Robert Huth. Correction - 84:42 Corner taken left-footed by Alessandro Diamanti, Manuel Da Costa takes a shot. Save by Thomas Sorensen. 84:42 Corner taken by Alessandro Diamanti, Header by Manuel Da Costa from deep inside the penalty area misses to the left of the target. 82:53 Substitution Benedict McCarthy joins the action as a substitute, replacing . Mido. 82:53 Shot from just outside the box by Jonathan Spector misses to the right of the target. 82:19 Corner taken left-footed by Alessandro Diamanti, Rory Delap manages to make a clearance. 81:55 Danny Collins sends in a cross, save by Robert Green. 78:51 The ball is sent over by Julien Faubert, Close range shot by Araujo Ilan misses to the left of the target. 78:38 Julien Faubert sends in a cross, clearance made by Danny Collins. 78:28 A cross is delivered by Julien Faubert, clearance by Liam Lawrence. 77:48 The offside flag is raised against Tuncay Sanli. Manuel Da Costa takes the free kick. 77:02 Danny Collins challenges Alessandro Diamanti unfairly and gives away a free kick. Valon Behrami takes the direct free kick. 76:25 Drilled right-footed shot by Tuncay Sanli. Save by Robert Green. 75:56 Alessandro Diamanti gives away a free kick for an unfair challenge on Tuncay Sanli. Free kick taken by Liam Lawrence. 75:08 Substitution Mark Noble goes off and Araujo Ilan comes on. 75:08 A cross is delivered by Valon Behrami. 74:41 Ricardo Fuller produces a left-footed shot from deep inside the penalty box which goes wide of the left-hand post. 73:16 Andy Wilkinson takes a shot. Blocked by Mark Noble. 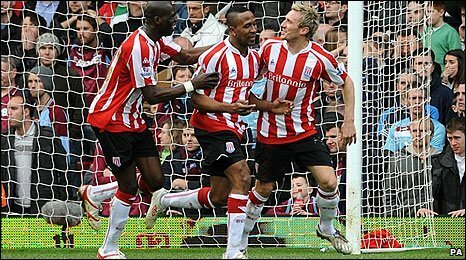 Corner taken by Liam Lawrence played to the near post, Foul by Robert Huth on Robert Green, free kick awarded. Robert Green takes the free kick. 71:21 Shot from outside the box by Robert Huth goes wide right of the target. 71:15 Liam Lawrence crosses the ball, clearance by Matthew Upson. 71:08 Rory Delap crosses the ball. Correction - 68:40 Assist on the goal came from Danny Collins. 68:40 Glenn Whelan provided the assist for the goal. 68:40 GOAL - Ricardo Fuller:West Ham 0 - 1 Stoke Ricardo Fuller finds the net with a fantastic goal from inside the penalty area high into the middle of the goal. West Ham 0-1 Stoke. 66:36 Substitution Matthew Etherington leaves the field to be replaced by Ricardo Fuller. 65:42 Jonathan Spector produces a cross, save by Thomas Sorensen. 64:40 . Mido takes a shot. Save by Thomas Sorensen. 63:13 Liam Lawrence takes a inswinging corner to the near post. 61:32 Unfair challenge on Matthew Etherington by Mark Noble results in a free kick. Free kick crossed right-footed by Liam Lawrence. 59:43 A cross is delivered by Valon Behrami, clearance by Robert Huth. Shot from just outside the box by Mark Noble goes over the crossbar. 58:05 Alessandro Diamanti has an effort direct from the free kick. 58:05 Booking Glenn Whelan goes into the book for unsporting behaviour. 58:02 Free kick awarded for a foul by Glenn Whelan on Carlton Cole. 57:26 Centre by Andy Wilkinson. 56:31 Unfair challenge on Mark Noble by Liam Lawrence results in a free kick. Direct free kick taken by Jonathan Spector. 56:12 Unfair challenge on Valon Behrami by Robert Huth results in a free kick. Robert Green takes the free kick. 55:40 Matthew Etherington delivers the ball, clearance by Matthew Upson. 54:50 Shot by Carlton Cole from 25 yards. Save made by Thomas Sorensen. 53:59 Robert Huth challenges Robert Green unfairly and gives away a free kick. Direct free kick taken by Robert Green. 52:04 The referee blows for offside. Thomas Sorensen takes the free kick. 49:11 Foul by Manuel Da Costa on Mamady Sidibe, free kick awarded. Glenn Whelan takes the free kick. Shot by Robert Huth. Scott Parker gets a block in. 48:48 Shot from 30 yards from Scott Parker. Save by Thomas Sorensen. 48:24 A cross is delivered by Matthew Etherington, Manuel Da Costa makes a clearance. 47:07 Substitution Tuncay Sanli on for Dave Kitson. 45:01 Substitution Kieron Dyer goes off and Alessandro Diamanti comes on. 45:00+3:31 It is the end of the first-half. 45:00+3:04 Dave Kitson has a drilled shot. Blocked by Manuel Da Costa. 45:00+2:49 . Mido gives away a free kick for an unfair challenge on Danny Collins. Free kick taken by Danny Collins. 45:00+2:18 The ball is delivered by Matthew Etherington, save made by Robert Green. 45:00+1:35 The ball is sent over by Danny Collins, clearance by Jonathan Spector. Inswinging corner taken by Matthew Etherington from the right by-line, . Mido manages to make a clearance. 45:00+0:46 Kieron Dyer takes a shot. Blocked by Robert Huth. Mark Noble takes a outswinging corner to the near post, Mamady Sidibe manages to make a clearance. 45:00+0:14 Free kick awarded for a foul by Dave Kitson on Manuel Da Costa. Robert Green takes the direct free kick. 44:29 . Mido challenges Glenn Whelan unfairly and gives away a free kick. Thomas Sorensen takes the free kick. 43:30 Liam Lawrence challenges Valon Behrami unfairly and gives away a free kick. Robert Green restarts play with the free kick. 42:45 Foul by Scott Parker on Liam Lawrence, free kick awarded. The free kick is swung in right-footed by Robert Huth. 41:36 Carlton Cole produces a cross, clearance made by Danny Higginbotham. 40:21 Valon Behrami has an effort at goal from just inside the box that misses to the left of the goal. 39:57 The ball is sent over by Glenn Whelan, save by Robert Green. 38:53 Julien Faubert produces a cross, clearance by Andy Wilkinson. 37:43 Mamady Sidibe challenges Matthew Upson unfairly and gives away a free kick. Robert Green restarts play with the free kick. 37:11 Mark Noble concedes a free kick for a foul on Glenn Whelan. Thomas Sorensen takes the free kick. 36:44 Dave Kitson is flagged offside by the assistant referee. Free kick taken by Robert Green. 34:40 Carlton Cole takes a shot. Save by Thomas Sorensen. . Mido takes a shot. Save by Thomas Sorensen. 33:48 The assistant referee signals for offside against Matthew Etherington. Free kick taken by Robert Green. 32:01 The ball is crossed by Danny Collins, clearance made by Matthew Upson. 29:56 Foul by Glenn Whelan on Valon Behrami, free kick awarded. Mark Noble takes the direct free kick. 29:06 Mamady Sidibe concedes a free kick for a foul on Mark Noble. Mark Noble restarts play with the free kick. 28:16 Inswinging corner taken left-footed by Matthew Etherington from the right by-line, Headed effort from inside the area by Danny Higginbotham misses to the left of the goal. 27:53 Carlton Cole challenges Andy Wilkinson unfairly and gives away a free kick. Glenn Whelan restarts play with the free kick. 27:12 Matthew Etherington produces a cross, clearance made by Jonathan Spector. 24:47 Substitution Andy Wilkinson is brought on as a substitute for Abdoulaye Faye. 23:13 Outswinging corner taken by Mark Noble, clearance made by Danny Collins. 22:50 Free kick awarded for an unfair challenge on Scott Parker by Mamady Sidibe. Direct free kick taken by Mark Noble. 21:42 Manuel Da Costa challenges Dave Kitson unfairly and gives away a free kick. Free kick crossed right-footed by Liam Lawrence, clearance by Carlton Cole. 19:46 The ball is delivered by Julien Faubert, Header from close range by . Mido misses to the right of the goal. 18:54 Robert Huth gives away a free kick for an unfair challenge on Carlton Cole. Free kick crossed right-footed by Mark Noble from left wing. 15:29 Free kick awarded for a foul by Valon Behrami on Liam Lawrence. Liam Lawrence takes the direct free kick. 14:30 Foul by Abdoulaye Faye on Carlton Cole, free kick awarded. Free kick crossed right-footed by Mark Noble from right channel, Danny Collins manages to make a clearance. 14:07 Effort from 18 yards by . Mido. Danny Collins gets a block in. 13:39 A cross is delivered by Liam Lawrence, save made by Robert Green. 12:07 The ball is swung over by Julien Faubert, Danny Higginbotham makes a clearance. 11:43 Dave Kitson crosses the ball. 9:59 Robert Huth fouled by . Mido, the ref awards a free kick. Free kick taken by Abdoulaye Faye. 8:07 Corner taken right-footed by Liam Lawrence from the left by-line, Abdoulaye Faye takes a shot. . Mido gets a block in. Corner taken left-footed by Matthew Etherington, Header by Abdoulaye Faye from deep inside the penalty area misses to the left of the target. 5:45 Effort on goal by Liam Lawrence from just inside the penalty area goes harmlessly over the target. 2:05 Unfair challenge on Dave Kitson by Matthew Upson results in a free kick. Matthew Etherington crosses the ball, Abdoulaye Faye takes a shot. Save by Robert Green. 0:52 The assistant referee flags for offside against Dave Kitson. Matthew Upson restarts play with the free kick. 0:14 The ball is crossed by Glenn Whelan.